COLUMBUS — Heavy rain can lead to hydroplaning vehicles and costly flood damage for motorists and homeowners. And with April just beginning, AAA urges motorists and homeowners to take caution when dealing with rising waters. Maintain tires: Tires are the main point of contact with the road. Adequate tire pressure and tread depth help the vehicle grip wet roads and prevent hydroplaning. Check tire pressure and tread depth regularly before driving. Improve visibility: Keep the windshield and headlights clean, and replace windshield wipers that leave streaks. Experts recommend replacing wipers every six months. 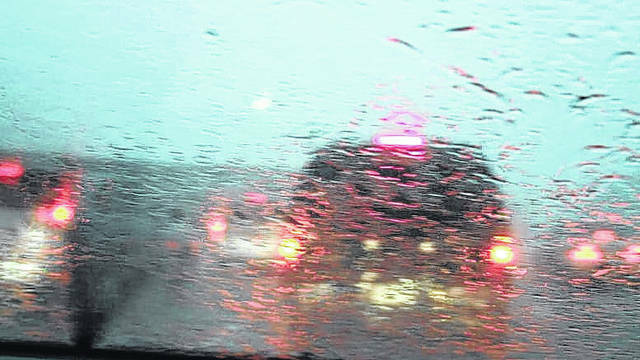 Recognize a crisis: If rain is so heavy that you can’t see the edges of the road or other vehicles at a safe distance, it’s time to pull off and wait for the rain to ease up. It’s best to stop at a rest area or exit the freeway and go to a protected area. If that’s not an option, get as far off the road as possible and turn on vehicle hazards. Avoid cruise control: Cruise control is designed for dry road conditions and doesn’t know when the pavement is wet. You’re more likely to hydroplane when using cruise control, because you’re not really in complete control of your vehicle. With some cars the wheels actually spin faster when cruise control is engaged and the vehicle hits a slick spot. Never drive through high water: A car can lose control in just a few inches of water. Six inches of water will reach the undercarriage of most vehicles and can damage vehicle components or even stall a car’s engine. Just a couple feet of water can carry away most vehicles. For more wet weather driving tips visit www.exchange.AAA.com. Just an inch of water can damage property, and flash floods can bring waves of water many feet high, according to the National Flood Insurance Program (NFIP). It’s important to understand which type of insurance is needed to cover various types of flood damage. Flood Insurance: Federal law requires flood insurance for federally financed loans for those who live in high-risk flood zones. Lenders may also require flood insurance for moderate risk zones. Homeowners Insurance: Flooding can also occur due to clogged drains or pipes, sewer backup or sump pump failure. Flood insurance does not typically cover sewer backup or sump pump failure. In these cases, homeowners insurance can help cover the costs. Often this coverage is added to the policy as an endorsement. Comprehensive Auto Insurance: A comprehensive auto insurance policy is needed to cover the costs of a vehicle damaged by flood waters. The NFIP can help homeowners determine their flood risk and help them learn about safeguarding their property. For more information, visit www.floodsmart.gov.